The propraetor of Nearer Spain, Tiberius Sempronius Gracchus, wins a string of victories over the Celtiberians; he subsequently pacifies the region by making lasting treaties with the tribes. King Philippos V of Macedonia dies; he is succeeded by his son Perseus. Remains of the Pons Aemilius. At the beginning of the year, the former praetor Quintus Fulvius Flaccus arrived outside the pomerium, the sacred boundary of Rome, to celebrate a triumph for his victories in Spain. While he was waiting for permission from the Senate, he was elected consul together with Lucius Manlius Acidinus Fulvianus. The latter had been born into the gens Fulvia and had later been adopted by a member of the ancient patrician gens Manlia. An interesting detail is that he was also Quintus Fulvius Flaccus’ brother, and this was in fact the only time in the history of the Roman Republic that two brothers jointly served as consuls. Flaccus’ triumph proved to be spectacular. Among several other things, 173.200 silver coins from Osca were carried in the procession, with Osca (now Huesca) being the minting centre of Spain in those days. The consul had promised a temple to Fortuna Equestris and games to Jupiter Optimus Maximus during his final battle against the Celtiberians, and now he made good on his pledge. There were also elections for the censors this year. The two men elected were old enemies, Marcus Aemilius Lepidus and Marcus Fulvius Nobilior (see 187 BCE). Fortunately for the Romans, they managed to settle their differences before commencing their activities as censors. Three senators were struck from the roll and Lepidus himself was appointed princeps senatus, replacing Lucius Valerius Flaccus (who had died the previous year). The censors let contracts for several important public works, chief among them the Basilica Fulvia Aemilia. This was a large basilica east of the original Curia and the comitium. It was significantly larger than the nearby Basilica Porcia, constructed by Cato the Censor in 184 BCE. 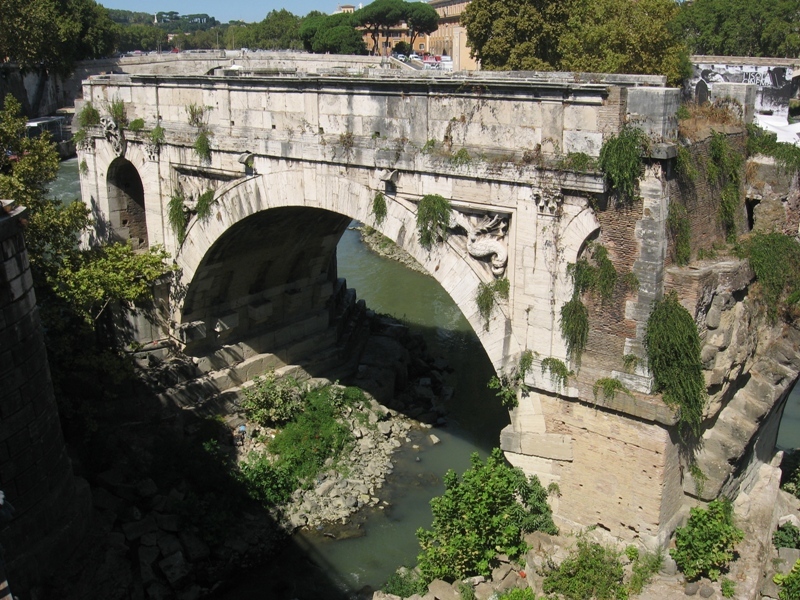 The censor Fulvius also commissioned the Pons Aemilius, the first stone bridge across the river Tiber in Rome ever. It connected the Forum Boarium – the cattle market district – with the area trans Tiberim, now called Trastevere. The bridge was not completed until several decades later, but its remains – now called the Ponte Rotto – can still be seen today. The censor Lepidus consecrated a temple to the Lares Permarini (Lares of the Sea) on the Field of Mars. This temple had been promised during the naval battle of Myonnesos in 190 BCE. 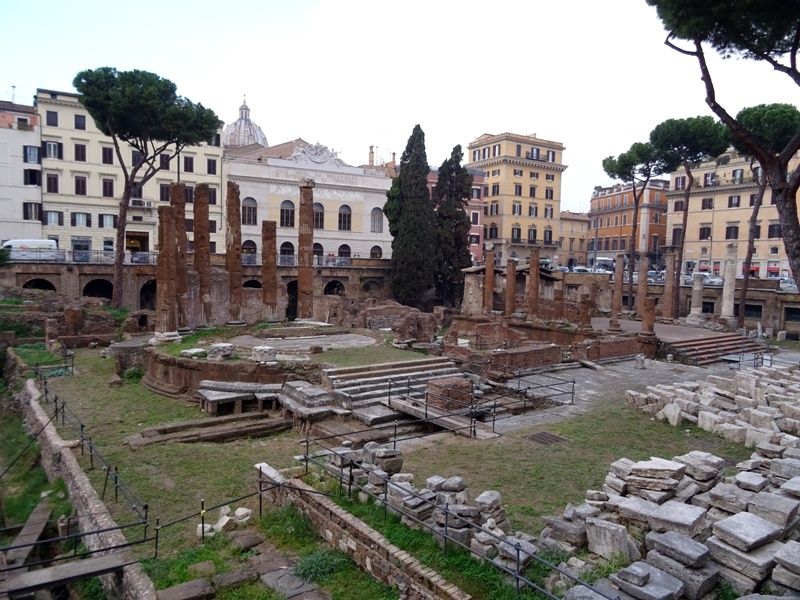 The remains of it – mostly covered by the street – can be found in the Area Sacra di Largo Argentina. Remains of the Temple of the Lares Permarini (on the left, partly below the street). Both consuls had been given Liguria as their province this year, but we only read of operations by Quintus Fulvius Flaccus in that region. The other consul, Manlius, did nothing worthy of note. In spite of the mass deportations of the previous year, this part of Italy was still not at peace. Flaccus led his men in a successful new campaign, defeated the Ligurians in a pitched battle and also managed to repulse an attempt by Celts from across the Alps to settle in the region. Some 3.000 of these tribesmen had asked the consuls and Senate for permission to live under the authority of the Roman people, but the senators turned down their request and told them to leave. The consul then made sure they did. After returning to Rome, Flaccus was awarded another triumph, but Livius adds that “it was generally believed that this triumph was granted to him more on personal grounds than because of the importance of his victories”. Area Sacra di Largo Argentina. The temple of the Lares Permarini is on the far left (not visible). Livius’ account of the war has, on the other hand, been preserved, and it must have been largely based on that of Polybius. So let us see what he tells us. 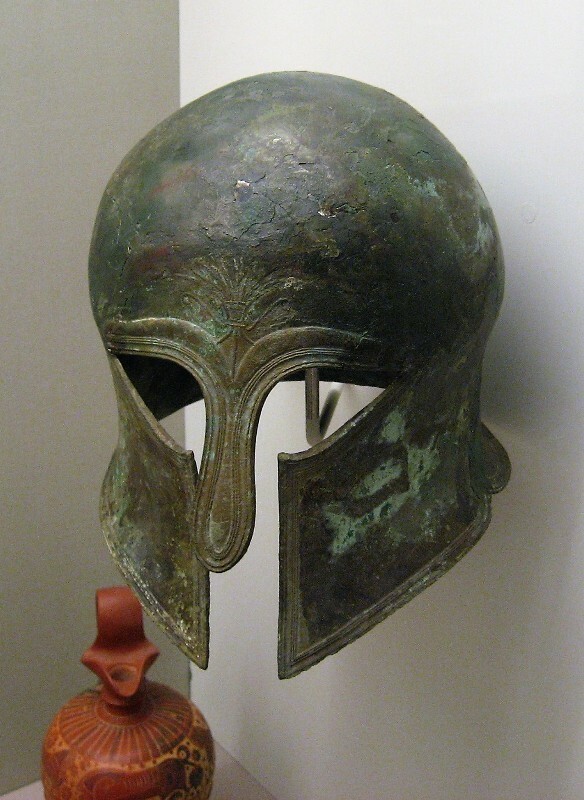 Gracchus first attacked the town of Munda and took it by storm during a daring night attack. He then attacked forts and burned fields before reaching another fortified town called Certima (possibly Cetina in Aragon). The town surrendered when no relief army turned up. Interestingly, Gracchus demanded forty horsemen from among the highest local nobility to serve in his army. Livius argues that they were de facto hostages, but there can be no doubt that they were excellent cavalry as well. The propraetor’s next target was the town of Alce, the location of which is unknown. There was a Celtiberian military camp here, and after a few days of skirmishing with the enemy pickets, Gracchus ordered the prefects of the allies to stage a feigned retreat. The allies advanced, pretended to be repulsed and fled back to the camp with the Celtiberians in hot pursuit. Gracchus had already formed up his men in battle order inside the camp and now ordered them to charge from the gates. The Celtiberian army had lost its cohesion and was taken completely by surprise. The Roman attack achieved complete success, cutting the enemy to pieces and capturing his camp. Livius states that the Romans suffered just 109 casualties themselves, and this number is so precise it may actually be correct. 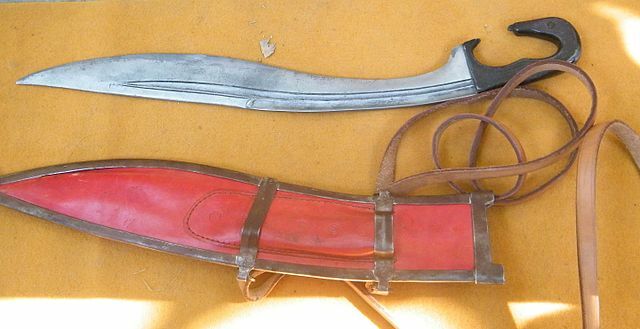 Replica of a falcata (image: Dorieo, CC BY-SA 3.0 license). After his victory, Gracchus thoroughly pillaged the lands of the Celtiberians, forcing the surrender of the 300 towns mentioned by Polybius, many of which were actually small fortresses, a fact correctly identified by Poseidonius and Strabo (see the quoted text above). The propraetor then returned to Alce and forced it into submission after a brief siege. The town proved to be a big prize. Not only did the Romans take much booty from it, they also took several important prisoners. Among them were two sons and a daughter of Thurrus, one of the most powerful chieftains in the region. After meeting with Gracchus, Thurrus switched sides and became a firm Roman ally. Hearing of the defeat of the tribes in the region, the town of Ergavica (near modern Cañaveruelas in Castile) decided to open its gates to the Romans. Livius admits that there are other sources regarding Gracchus’ campaign as well, and that these claim that the Celtiberians were only defeated after heavy fighting and significant Roman casualties. However, all sources seem to be in agreement that Gracchus’ expedition was a great success. He made treaties with a large number of Spanish tribes and secured relative peace in this part of the Iberian peninsula for the better part of 25 years. In Asia Minor, the war between Kings Eumenes of Pergamum and Ariarathes of Cappadocia on the one hand and King Pharnakes of Pontos on the other came to a close. Pontos was exhausted by the conflict, and after a new and devastating attack by Eumenes and Ariarathes, it sued for peace. Being on the losing side, Pharnakes had to promise never to threaten Galatia anymore. He also had to give up his conquests in Paphlagonia, but seems to have been allowed to keep the important Black Sea port of Sinope, which he had captured in 183 BCE. Sinope was ultimately to become one of the two capitals of the Kingdom of Pontos, the other being the city of Amaseia further to the east. In Macedonia, King Philippos V passed away in the autumn of this year. The king was almost sixty years old, exhausted from a life full of military campaigns, tired of being humiliated by the Romans and grief-stricken about the death of his son Demetrios two years previously. The king was succeeded by his other son, Perseus. There had been another candidate for the throne, a certain Antigonos, who was a nephew of Antigonos III Doson, the regent for Philippos when he was still a minor and the de facto King of Macedonia from 229 to 221 BCE. But Perseus had his rival murdered and was subsequently accepted as the new king by the army, the base of power for all Kings of Macedonia. 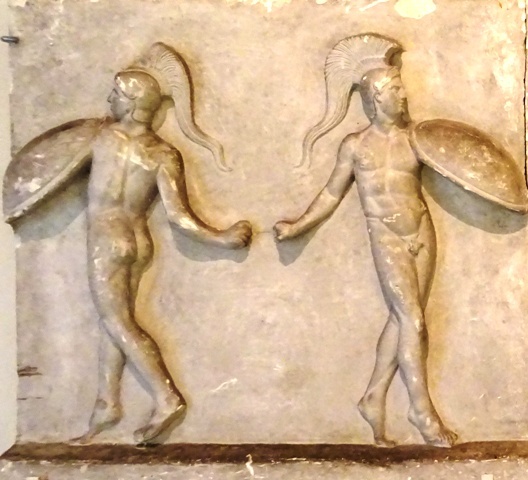 Ostensibly, Perseus sought to renew the ties of friendship with the Roman Republic, but at the same time he tried to endear himself to the Greeks. Strabo, Geography, Book III, Chapter 4. It was in fact completed when Publius Cornelius Scipio Aemilianus and Lucius Mummius were censors, which was in 142-141 BCE. Fulvius had the stone pillars of the bridge set up, while the bridge itself was still made of wood. Scipio Aemilianus and Mummius added stone arches (Livius 40.51). It is not entirely clear whether the bridge was named after Fulvius’ colleague Marcus Aemilius Lepidus. It may also have been named after the censor Scipio Aemilianus, who had been born into the gens Aemilia. A famed philosopher and historian from Syria, who lived from ca. 135 until 51 BCE. Strabo, Book III, Chapter 4. Not the Munda where Caesar defeated the Optimates in 45 BCE, which was in Southern Spain. The tombs of the Kings of Pontos were in Amaseia.